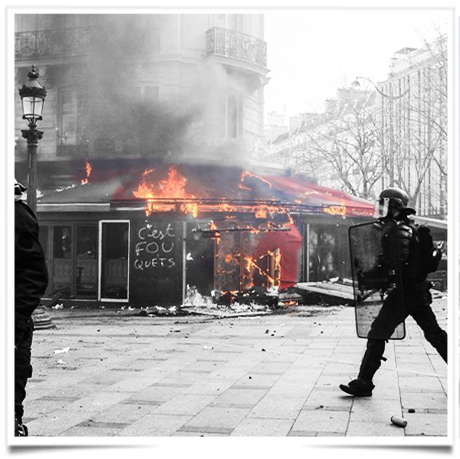 &quot;Like a huge majority of French people, today I feel a great anger wrote French prime minister Edouard Philippe on Twitter.The acts committed today weren’t done by protesters, but by looters, incendiaries and criminals. No cause justifies this violence. Barricades closed off the Faubourg Saint-Honoré area on Saturday morning, with most luxury stores choosing to keep their doors shut. Eight metro stations remained closed all day, the luxe in the whole has been affected by those strikes mainly lead by people fighting against people earning a lot of money. This entry was posted in BREAKING MODE, BREAKING NEWS and tagged GILET JAUNES by admin. Bookmark the permalink.